Exquisite silk textile in progress; Bhutan. Join us on a fabulous 17-night textile tour of Bhutan to see exquisite weaving, pristine wilderness and stunning Buddhist temple monasteries! 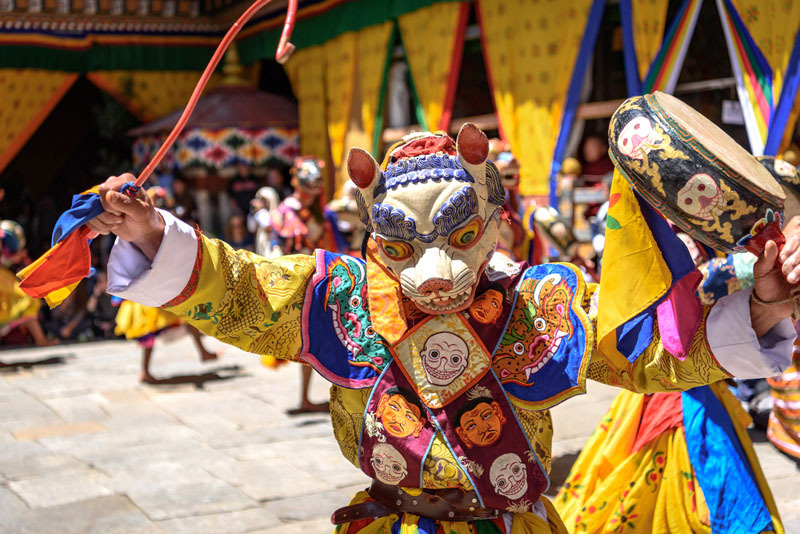 We’ll attend festivals called tshechus where spectators show off their best traditional clothing, and costumed dancers wear carved wooden masks. And we’ll meet warmhearted people and eat delicious new foods. 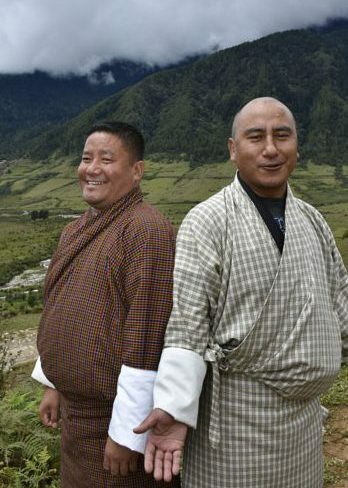 Bhutan is a brand new destination for Behind the Scenes and we are very excited about it. Many people had asked me about a textile tour of Bhutan so I, Cynthia, traveled there with three friends in September to plan it. 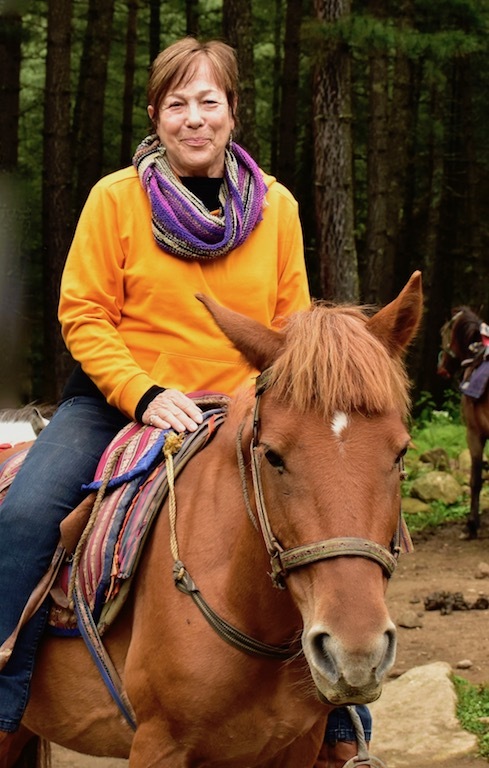 I loved everything about the country -the ultra-decorated buildings, the crisp air, the dark green forests, the kind people and the amazing handwoven clothing. I met charming guides and affable, professional drivers. Our guide was both funny and informative, and he will accompany us on this new trip. The amenable driver even hiked up to the Tiger Nest Monastery with us to help on the steep trail. This trip reflects authentic Bhutan. The Bhutanese have safeguarded their Buddhist culture and ancient way of life, and it’s the traditional aspects that lend great charm and value to the country. The guide and I have coordinated this itinerary to begin travel in the less-visited and more rural eastern regions where the weaving and the festivals are spectacular. Later we’ll head for the capital and the west. Valley landscape in western Bhutan. Bhutan is a tiny landlocked country in the eastern Himalayas, with a progressive young king, and a beautiful queen who promotes textiles and weaving. The country was closed to outsiders for centuries but now is welcoming travelers. The infrastructure of Bhutan improves annually, thus there are now better roads and hotels than in past years. Traveling from east to west, our group will meet in Kolkata (Calcutta), and conquer our jet-lag with two nights there. We’ll have a city tour and see some typical textiles, then fly to Guwahati, Assam, India. Then the adventure begins! We’ll drive from Guwahati into Bhutan at the southeastern border town of Samdrup Jongkhar. Then we’ll go north to Trashigang and many other towns and villages where the art of weaving excels. The whole eastern region is relatively undiscovered compared to the west, and it’s the area famous for the high quality woven textiles made here. We’ll visit several large towns and many villages in the area, and see fabulous festivals. Continuing west, we’ll see weavers, markets and typical villages and another festival along the way. Many of these destinations also have spectacular dzongs or ancient fortress-type building complexes. Masked dancer at a Buddhist festival, Paro. Dzongs are unique architectural forms in Tibet and Bhutan. Built mainly in the seventeenth century as fortresses and centers of religious authority, today they continue to serve as important administrative and monastic centers. As recently as 1998 by royal decree all new and remodeled buildings had to be be constructed with multi-colored wood frontages, small arched windows, and sloping roofs. Architecture typical of Bhutan includes highly decorative window frames, carved columns, and painted beams. We will stay in hotels with this sort of decoration and will stop to check out other buildings with intriguing painted images. After we have explored eastern and central Bhutan, we’ll avoid an 11-hour drive over rough roads by flying from Bumthang (Jakar airport) to Paro. In the nearby capital of Thimpu, we’ll visit the important and up-to-date Textile Museum. Then we’ll check out a weaving center, and the Handicrafts Emporium where they sell various crafts plus handwoven fabrics. Among other sights in Paro, we’ll see the National Museum if open. The day-trip below to the cliff monastery begins in Paro and we return to our hotel there for the night. After four days in the Paro-Thimpu area, we’ll fly back to Calcutta from Paro, and connect to home. Cynthia, riding to the halfway point of Tiger’s Nest. The trek will be optional with the ascent either on foot or horseback. Horses climb only to the teahouse at mid-point up the trail. They are healthy and don’t have to wear a bit, so they can pick their way along the rocky trail to find the best route. Many people walked up trail as we walked down, so if you are fairly fit, it’s not at all impossible to climb up the trail on foot. For the last and steepest part all the way to visit the monastery, the guide will walk with those who want to climb. 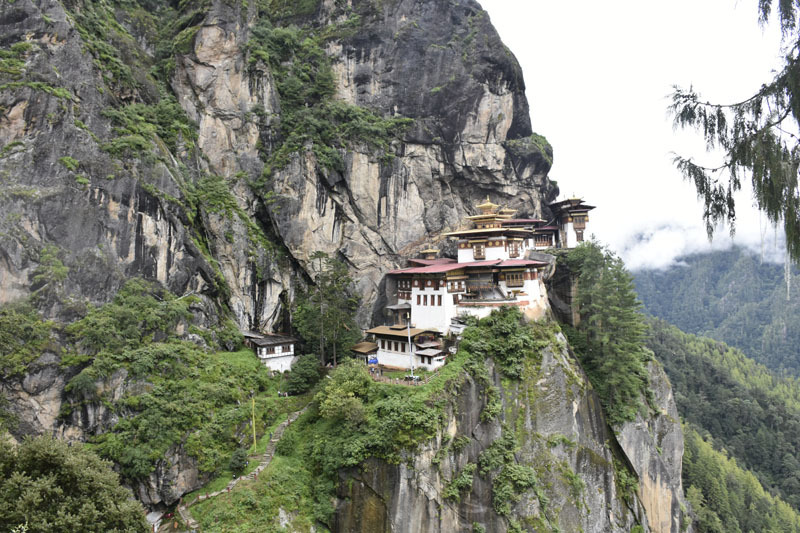 The rest of us can sit below at the tea house, relaxing among the prayer flags, drinking milky chai tea, and staring upward at the beautiful buildings on the cliff. It’s necessary to hike back down on foot. The descent isn’t bad if we go slowly; some people might want walking sticks for this part. And if a mountain trek isn’t your cup of tea, you can relax at the hotel or explore Paro instead! 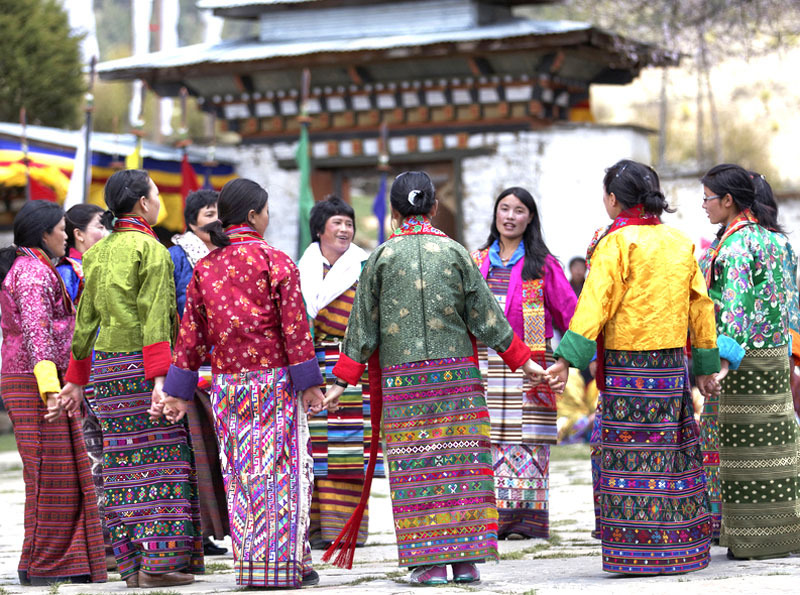 In 2005, the Queen of Bhutan created The Royal Textile Academy, the Textile Museum that we will visit in Thimpu. She also encouraged weaving centers so that the country’s youth may learn to appreciate, conserve and promote the weaving and fabric arts done all over the nation. She writes that “…the thagzo or art of weaving is a symbol of national identity that continues to play a significant role in all religious, official and social events. 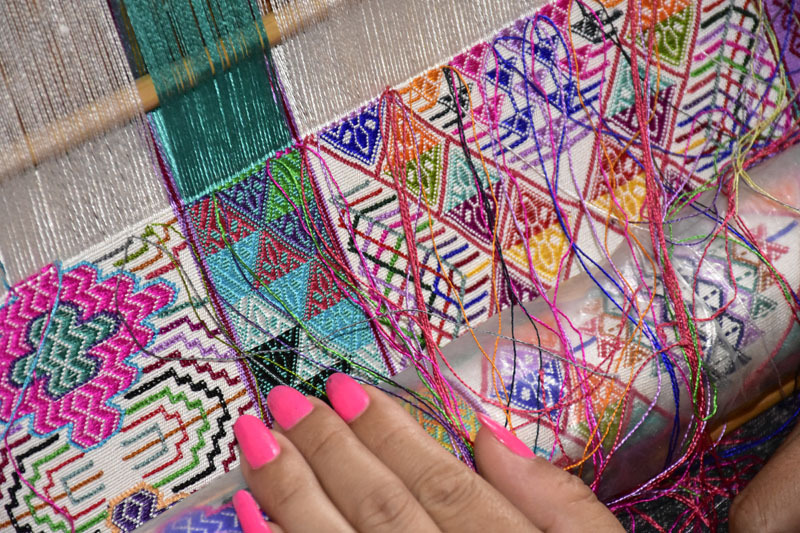 Weaving represents the very heart and soul of the country…” It’s interesting to note that while the women weave the clothing and fabrics, it’s the men who embroider and appliqué items such as temple hangings, saddle covers, shoes, hats, and ceiling canopies. The guys show off their typical gho. In the past, Bhutanese citizens followed an imposed dress code. Everyone wore handwoven traditional clothing: the gho for men and the kira for women. Nowadays that has changed, and it’s required only for government and office workers, and for school uniforms. Some young people have begun to adopt jeans and sweatshirts, but most people still proudly wear typical outfits everyday. And for festivals and special occasions such as weddings, everyone dons their very best and latest styles of handmade national dress. The gho that the men wear is a wrapped knee-length robe with long white cuffs, tied at the waist by a woven belt known as kera. The pouch which forms at the front traditionally was.used for carrying food bowls and a small dagger. Today men store their cell phones and wallets in the pouch; see photo at left of men in gho with bulging front pouches. 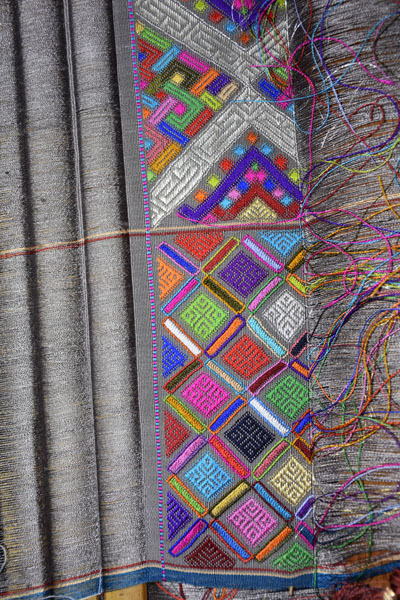 Detail of supplementary weft weaving of one kira panel, out of three. Women wear the kira, an ankle-length dress made of handwoven panels wrapped around the body and pinned at the shoulders. Over the kira they add a satin or brocade outer jacket known as a tego, with an inner blouse or layer called a wonju. However, people of ethnic groups such as the Bramis and Brokpas of eastern Bhutan generally wear clothing that differs from the rest of the Bhutanese population. Women dance in traditional kira. We’ll visit many weaving households and some larger weaving organizations in various towns and we’ll learn about the incredibly labor-intensive techniques used to make the women’s wrap dresses called kiras. The best place to see the women showing off their most exquisite outfits is of course at the three Buddhist celebrations that we will attend. For the finest pieces, weavers use complex pickup techniques that sometimes involve wrapping the weft around the warp in specific patterns. This is called trima, and often looks like a chained embroidery technique. Because a finely detailed kira (right) can take almost a year to weave, a very intricate piece can cost several thousand dollars. Belts are stunning too, and quite affordable. As we visit the weaving centers, we’ll appreciate the huge variety of designs and color combinations, and perhaps find some textiles to buy! Bhutan landscape with rice fields. 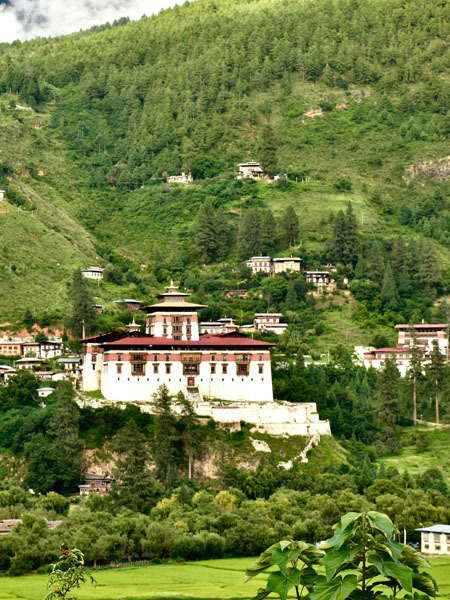 Includes visa for Bhutan (see below), 17 nights in comfortable hotels in double/twin rooms with private bath, all meals (often buffets), all soft drinks and bottled water with meals, airport transfers for all flights, city tour in Calcutta, three flights from Calcutta (Kolkata) to Guwahati; Jakar to Paro and Paro back to Kolkata; English-speaking Bhutanese licensed guide during the trip, all in-country ground travel by private van with professional driver, tips for guide and driver, horseback transport to Tiger’s Nest Monastery tea house, entrance to all museums and sites on the itinerary, and an 8″ x 11″ photo book documenting your trip. Not included: International airfare, alcoholic beverages, personal items such as laundry charges and any between-meal snacks or drinks. A generous tip per person for the guide and the van driver has already been added to the trip cost, so you don’t have to worry about tipping. 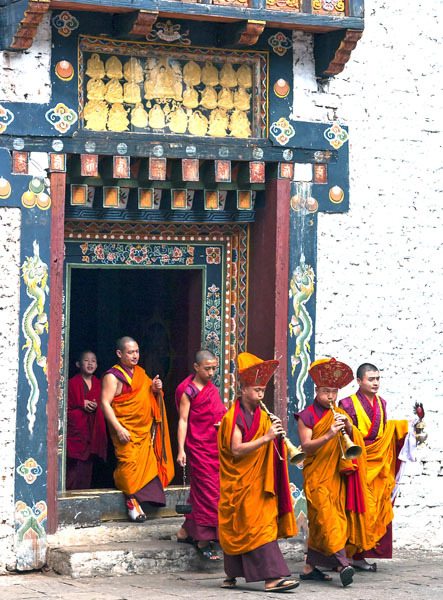 Monks at a festival in Trashigang. Plan your flights to arrive in Kolkata on November 30 and to return home from Kolkata (Calcutta) on December 17. Air India now has flights from Bangkok to Kolkata (CCU airport code) and this may be more convenient than going through Europe for California/West Coast folks. FLY HOME APRIL 4 for 2020 tour. We will arrange the visas for you; you will need to send a scanned colored copy of your passport to the agent handling the visas; it’s all safe and official. When you arrive, you will get a piece of paper that serves as your official visa until you get a small stamp in your passport when we enter. More info about visas and how to apply once you have signed up. All photos by Cynthia except festival shots (Shutterstock) and Tiger’s Nest by Sudhir Joshi.